We designed a dry-type 16 channel EEG sensor which is non-invasive, deformable, and re-usable. This paper describes the whole process from manufacturing the proposed EEG electrode to signal processing of visual evoked potential (VEP) signals measured on a mouse scalp using a dry non-invasive multi-channel EEG sensor. Yeon, C., Kim, D., Kim, K., Chung, E. Visual Evoked Potential Recordings in Mice Using a Dry Non-invasive Multi-channel Scalp EEG Sensor. J. Vis. Exp. (131), e56927, doi:10.3791/56927 (2018). 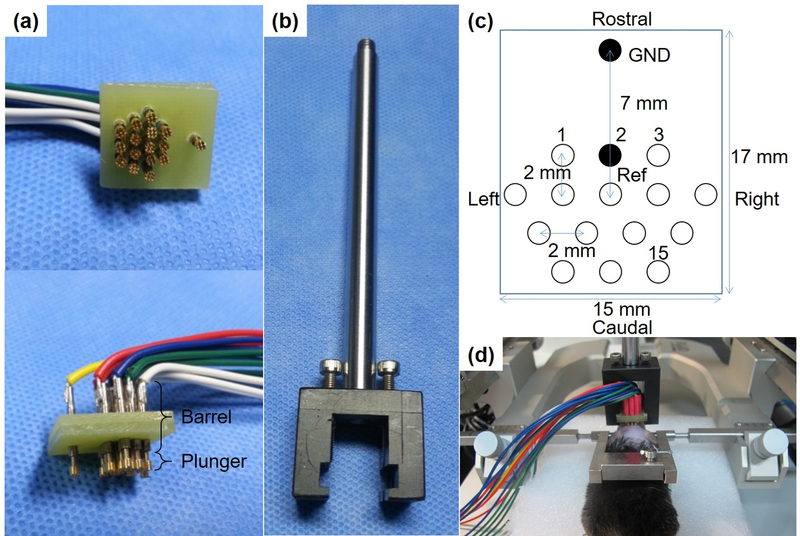 For scalp EEG research environments with laboratory mice, we designed a dry-type 16 channel EEG sensor which is non-invasive, deformable, and re-usable because of the plunger-spring-barrel structural facet and mechanical strengths resulting from metal materials. The whole process for acquiring the VEP responses in vivo from a mouse consists of four steps: (1) sensor assembly, (2) animal preparation, (3) VEP measurement, and (4) signal processing. This paper presents representative measurements of VEP responses from multiple mice with a submicro-voltage signal resolution and sub-hundred millisecond temporal resolution. Although the proposed method is safer and more convenient compared to other previously reported animal EEG acquiring methods, there are remaining issues including how to enhance the signal-to-noise ratio and how to apply this technique with freely moving animals. The proposed method utilizes easily available resources and shows a repetitive VEP response with a satisfactory signal quality. Therefore, this method could be utilized for longitudinal experimental studies and reliable translational research exploiting non-invasive paradigms. As the number of patients with senile degenerative brain diseases such as dementia, Alzheimer's, Parkinsonian syndromes, and stroke have increased with an aging population and an increasing life expectancy, the long-term societal burden of these diseases has also increased1,2,3. In addition, most neurodevelopmental diseases, such as Schizophrenia and autism, are accompanied by cognitive and behavioral disorders which affect a patient's whole life2,3,4. For this reason, researchers have been struggling to improve the diagnosis, prevention, pathological understanding, long-term observation, and treatment of brain diseases. However, problems remain stemming from the brain's complexity and unrevealed disease pathologies. Translational research may be a promising tool for identifying solutions because it enables the transfer of basic research to clinical applications within a shorter time frame, at lower cost, and with a higher success rate in neuroscience fields5,6,7. Another goal of translational research is to examine applicability in human subjects, which requires non-invasive experimental approaches in animals that allow comparisons to the same method for humans. These conditions have led to several significant needs for developing non-invasive animal preparation methods. One method is electroencephalography (EEG), which reveals cortical brain connectivity and activity two-dimensionally with high temporal resolution, and which benefits from a non-invasive protocol. 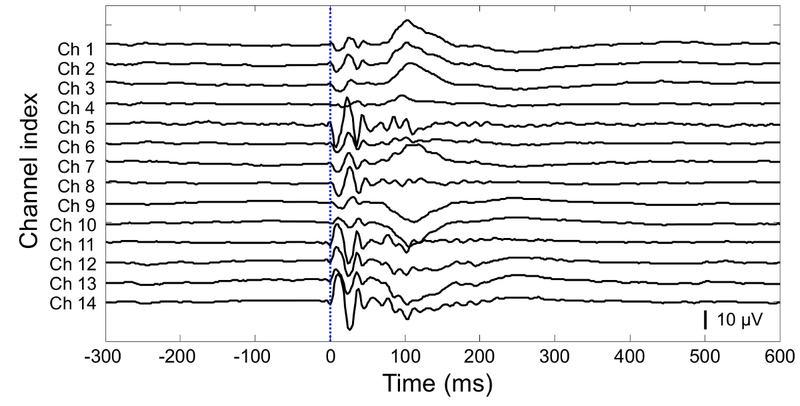 The event-related potential recording (ERP) is one of the typical experimental paradigms that utilize EEG. Numerous previous studies employed non-invasive EEG methods for targeting humans subjects, whereas invasive methods, such as implant screws and pole type electrodes, have been used in animal studies8,9,10,11,12. The signal quality and characteristics of these methods are significantly reliant on the invasiveness of the sensor placement. For successful translational research, Garner emphasized using the same conditions for animal study as those used for human research13. For basic research using animals, however, non-invasive EEG methodologies are not prevalent. A novel approach using a non-invasive scalp EEG sensor system focusing on laboratory mice would be a reliable and efficient tool for translational research that can be applied to the non-invasive paradigms for human beings, as well. Numerous mouse EEG studies led the way by commercializing PCB (printed circuit board) based multi-channel electrodes14,15,16. Although they adopted an invasive method, they had a restricted number of channels (3-8), which made it harder to observe large-scale brain dynamics. Furthermore, applications can be restricted by their invasiveness and high cost. In another research study, the KIST (Korea Institute of Science and Technology) developed a 40 channel polyimide-based thin-film electrode and attached it to a mouse's skull17,18,19,20. This work acquired the highest number of mouse EEG channels. It was, however, mechanically weak and not easy to reuse; therefore, it was inappropriate for long-term observations, leading to a weakened signal, possibly caused by an immune reaction. Meanwhile, Troncoso and Mégevand acquired a sensory evoked potential (SEP) on rodents' skulls with thirty-two stainless steel electrodes secured by a perforated Poly(methyl methacrylate) (PMMA, acrylic glass) grid21,22,23. Despite their high signal quality, the electrodes were mechanically flexible and tender; therefore, they had difficulties being applied to multiple experiments. In addition, this method was still minimally invasive. Although these methods provide good signal quality, the surface area of a mouse's skull is limited, therefore the number of electrodes is restricted using a stainless pole-type electrode. A number of previous EEG studies for mice showed several limitations. In this study, we will show a new method for measuring EEG applicable in pre-clinical translational research using a non-invasive dry-type multi-channel sensor. In order to overcome the limitations of previous animal EEG methodologies, which included the intrinsic complexity of animal preparation, invasiveness, high cost, wastefulness, and weak mechanical strength, we sought to develop a new electrode which exhibits flexibility, dry type status, multi-channel capabilities, non-invasiveness, and re-usability. In the following protocol, we will describe the process of measuring visual evoked potential (VEP) recordings on a mouse scalp using a dry, non-invasive, multi-channel EEG sensor. This method utilizes easily available resources, therefore lowering the barrier to entry into animal experimentation in the biomedical engineering field. Animal care and handling followed the institutional guideline of the Gwangju Institute of Science and Technology (GIST). NOTE: The procedure for acquiring the VEP signal from a mouse in vivo consists of four steps: (1) sensor assembly, (2) animal preparation, (3) VEP measurement, and (4) signal processing. Prepare sixteen pins for one non-invasive electrode. NOTE: Each pin-type electrode consists of three parts: a probe head plunger, an internal spring, and a barrel as shown in Figure 1a. The length of each pin is 13 mm, and the adjustable spring pre-load length is 1 mm. Cut two pieces of glass fiber substrates (thickness: 1.5 mm) with the size of 15 mm × 17 mm (width × height). NOTE: The non-conducting fiberglass substrate functions as an insulator, which separates the multiple signals acquired simultaneously from the mouse's scalp. Make sixteen holes of diameter 1.2 mm each using a precision engraving machine, as shown in Figure 1c. Spread out the probe coordination evenly at an interval of 2 mm onto the flat substrate: +7/0, +2/-2, +2/0, +2/+2, 0/-4, 0/-2, 0/0 (bregma), 0/+2, 0/+4, -2/-3, -2/-1, -2/+1, -2/+3, -4/-2, -4/0, -4/+2 (anteroposterior/lateral with basis of bregma, in mm)24,25,26. Stack two substrates and apply one drop of fast-acting adhesive glue between substrate layers, producing a double-layer of 3 mm thickness supporting sixteen stable and parallel electrodes during signal acquisition. Assemble the sixteen electrodes onto the substrate one-by-one manually. NOTE: The smaller hole diameter stops each electrode at the same length. Each hole diameter is slightly smaller than the thickest diameter of a barrel within the single pin (1.3 mm) which enables the tight fixing of electrodes without any loosening. Solder and link each electrode's ending solder-cup part to the touch proof connector. Cover and hide the naked junctions with heat-shrink tubing for electrical insulation. Anesthetize the mouse with an intraperitoneal (i.p.) injection of ketamine:xylazine 100:10 (100 mg/mL:10 mg/mL) mixture with the amount of 10 µL/g of body weight. NOTE: Check the animal's anesthesia is adequate by pulling one leg or tweaking the tail before starting preparation. Apply eye ointment to keep the mouse's cornea moist with a cotton swab. Remove the hairs around the head and shoulders with a hair-clipper, and then spread commercially available depilatory cream and keep it on this area for 3-4 min. Remove the applied depilatory with a spatula, and then wipe up the rest with wet wipes applying water several times. NOTE: The whole VEP measuring process took place in a dark Faraday cage (width × depth × height: 61 × 61 × 60 cm). Mount the mouse's head onto the stereotaxic frame by placing ear bars into the mouse's ear canals and tightening them precisely in place. Mount the sensor into the custom-made electrode holder (Figure 1b) and fix the sensor holder onto the stereotaxic frame, as shown in Figure 1d. Locate the flexible EEG sensor, considering both the reference electrode position and the bregma position27. After that, very carefully lower the sensor in the vertical direction so that the arrayed electrode plungers contact the mouse's scalp evenly onto the curved margin. NOTE: The lowered distance is smaller than 1 mm, which is the adjustable length of the plunger. Check that the impedances are within the proper range from 100 kΩ to 2 MΩ. Reposition the electrode when any impedance value of the pin is out of the range28. Position the photo stimulator 20 cm away from the mouse's eyes. Before starting the experiment, adapt the mouse for 10 min in the dark cage for dark visual adaptation. Set the parameters of the experimental devices as follows: Sampling frequency: 500 Hz; Notch filtering: 60 Hz; Inter-stimulus interval: 10 s; Flash duration: 10 ms; number of flash stimuli: 100 trials/subject. NOTE: The flash light is a white light LED illumination which has 550 ± 20 % lx with a distance of 20 cm. For continuously measuring serial data, extract each epoch to create single-trial VEP segments from the pre-stimulus period (-300 ms) to the post-stimulus period (600 ms), based on the flash stimulus onset. NOTE: Since we repeatedly provide flash stimulation over 100 trials for each subject, a total of 100 VEP epochs for each mouse are extracted in this step. EEG epoching is a process in which specific time-windows are extracted from the continuously measured EEG signal data. Compute the average of EEG signals across all fourteen electrode channels at each time point and then subtract the averaged value from each channel. Repeat this procedure for all the VEP epochs. Perform band-pass filtering of signal from ~1-100 Hz using a finite impulse response (FIR) filter. Calculate the average of the EEG signals in the pre-stimulus period (baseline period, -300 ~ 0 ms) for each channel, then subtract this average from each point in the waveform (-300 ~ 600 ms). This adjusts the amplitude axis of VEP responses to facilitate the observation of brain wave changes after stimulation. Repeat this step for all of the VEP epochs. Average the single-trial VEP epochs to create single-subject averaged VEP waveforms for each channel. Then, calculate the grand ensemble average of VEP responses for each channel with respect to all the subjects. We calculated the ensemble average of VEP responses from eleven mice as shown in Figure 2. This result shows the VEP responses obtained through this experiment from the pre-stimulation period (-300 ms) to the post-stimulation period (600 ms), as the stimulation is given at time 0 s. It is noticeable that the signal fluctuates only for a while (less than 300 ms) after the stimulation, while the signal steadily stabilizes over time during the post-stimulation period. Furthermore, the fourteen channels can be categorized into several groups based on the VEP responses, revealing similar morphologies and patterns29. This method provides insights into the comprehension of brain wave dynamics with respects to temporal and spatial qualities. Figure 1: Mouse EEG sensor description and instructions for using the mouse EEG sensor. (a) 16 pin EEG electrode (b) the customized electrode holder (c) the sixteen electrodes array pin map; the ground electrode (GND) and the reference electrode (Ref) is highlighted in black (d), in vivo mouse EEG measurement using the proposed sensor and the customized holder on the stereotaxic frame. This figure has been modified from 29. Please click here to view a larger version of this figure. Figure 2: Representative visual evoked potential experimental results from the fourteen channels. Grand averaged visual evoked potential signals of all eleven subjects and all trials from the pre-stimulation period (-300 ms) to the post-stimulation period (600 ms). Please click here to view a larger version of this figure. We firstly focused on the design of the sensor, prioritizing practicality by minimizing complex surgical procedures. The deformable EEG sensor is comprised of sixteen pins: fourteen for recording, one for ground, and the last one for reference electrodes. Each electrode has the plunger-spring-barrel structure, which applies deformability onto the electrode's contact surface, so they facilitate uniform and stable signal acquisition from the curved and tender mouse's scalp. Considering the welfare of the animals, we tried to minimize the pain incurred by the spring force by alleviating pressure applied to the skin by widening the contact area of the skin-electrode interface29. The individual pins composed of the whole multi-channel electrode can have varying specifications for thickness, length, plunger types, and spring strength. These various options should be contemplated to design the electrode to relieve the subject's suffering. In addition, the pin map array and the number of electrodes can be modified according to the purpose of the experiment. The electrode holder and fiberglass substrate can be made by other methodologies and different designs, such as a 3D printing method30,31. In general, the impedance of a dry electrode has shown higher impedance, and causing a lowered signal quality compared to a wet electrode32,33. We could confirm the appropriate locations of the sixteen electrodes under the even force on the scalp through checking the impedance within a proper range from 100 kΩ to 2 MΩ: the range was comparable with the commercialized dry-type EEG electrode for a human33. The impedance values range from 296.2 KΩ to 1,522.6 KΩ (mean ± SD: 825.2 ± 443.2 KΩ). Meanwhile, the mechanical pressure to the scalp caused by internal springs possibly lowered the electrode's impedance, therefore, this may affect the signal improvement34. Although it is possible to enhance signal quality through applying conducting gel onto the pin heads' surface, this can cause signal interference among adjacent pins because of the confined mouse's scalp area. In order to prove the in vivo utility of the newly designed EEG sensor, we implemented the event-related potential recording paradigm VEP, which is one of the typical passive EEG paradigms. Although we measured VEP signals onto the mouse's scalp without any conducting wet gel, the signal was comparable to the previous VEP result of the epicranial EEG from the same mouse species27. During the VEP measuring process, the grounding of all the individual parts, such as the stereotaxic frame and electrode holder, is an essential process to minimize electrical noise from outside. We also maintained mice for 10 min before starting the VEP experiment, for dark visual adaptation and primary sensory adaptation35,36. In conclusion, we demonstrate a repeatable experimental protocol to provide visual evoked potential using the non-invasive dry multi-channel mouse scalp EEG sensor. The method described here is non-invasive, thus it does not require any additional surgical preparation, as well as reducing the time for preparing conducting gel, if dry-type electrodes are used. Moreover, a sensor possessing multiple electrodes enables us to measure the brain waves from different scalp areas simultaneously. The proposed method for a non-invasive scalp EEG sensor may contribute to translational research areas connecting basic science results to human studies with comparable, reliable, and efficient results. Ultimately, an approach with these significant characteristics provides convenience and safety both to users and subjects. Still, there are further research issues, such as enhancing the signal quality, comparing signal quality with other brain wave acquisition methodologies, and applying these methods into the freely moving mouse. Moreover, the presented method has further possibilities for application to preclinical small animal EEG studies in vivo, large scale brain network analysis, sensory evoked potential recordings, and combinations with brain stimulation or surface-deep electrophysiological recording methods. This work was supported in part by the GIST Research Institute (GRI), the GIST-Caltech Research Collaboration Project through a grant provided by GIST in 2017. Also supported by research grant (NRF-2016R1A2B4015381) of the National Research Foundation (NRF) funded by the Korean government (MEST), and by KBRI basic research program through Korea Brain Research Institute funded by the Ministry of Science, ICT, and Future Planning (17-BR-04). Stainless Steel Micro Spatulas HEATHROW SCIENTIFIC HS15907 One Round Flat End, 2L x 5/16W"
Alzheimer's Association. Alzheimer's disease facts and figures. Alzheimers Dement. 12, (4), 459-509 (2016). Birbeck, G. L., Meyer, A. C., Ogunniyi, A. Nervous system disorders across the life course in resource-limited settings. Nature. 527, (7578), S167-S171 (2015). World Health Organization. Neurological disorders: public health challenges. World Health Organization. (2006). Meyer, U., Feldon, J., Dammann, O. Schizophrenia and Autism: Both Shared and Disorder-Specific Pathogenesis Via Perinatal Inflammation? Pediatr Res. 69, (5), 26r-33r (2011). Freedman, L. P., Cockburn, I. M., Simcoe, T. S. The Economics of Reproducibility in Preclinical Research. PLoS Biol. 13, (6), e1002165 (2015). Cummings, J. L., et al. Alzheimer's disease drug development: translational neuroscience strategies. CNS Spectr. 18, (3), 128-138 (2013). Roelfsema, P. R., Treue, S. Basic neuroscience research with nonhuman primates: a small but indispensable component of biomedical research. Neuron. 82, (6), 1200-1204 (2014). Wu, C., Wais, M., Sheppy, E., del Campo, M., Zhang, L. A glue-based, screw-free method for implantation of intra-cranial electrodes in young mice. J Neurosci Methods. 171, (1), 126-131 (2008). Yu, F. H., et al. Reduced sodium current in GABAergic interneurons in a mouse model of severe myoclonic epilepsy in infancy. Nat Neurosci. 9, (9), 1142-1149 (2006). Parmentier, R., et al. Anatomical, physiological, and pharmacological characteristics of histidine decarboxylase knock-out mice: evidence for the role of brain histamine in behavioral and sleep-wake control. J Neurosci. 22, (17), 7695-7711 (2002). Handforth, A., Delorey, T. M., Homanics, G. E., Olsen, R. W. Pharmacologic evidence for abnormal thalamocortical functioning in GABA receptor beta3 subunit-deficient mice, a model of Angelman syndrome. Epilepsia. 46, (12), 1860-1870 (2005). Wu, C., Wais, M., Zahid, T., Wan, Q., Zhang, L. An improved screw-free method for electrode implantation and intracranial electroencephalographic recordings in mice. Behav Res Methods. 41, (3), 736-741 (2009). Garner, J. P. The Significance of Meaning: Why Do Over 90% of Behavioral Neuroscience Results Fail to Translate to Humans, and What Can We Do to Fix It? Ilar Journal. 55, (3), 438-456 (2014). Naylor, E., Harmon, H., Gabbert, S., Johnson, D. Automated sleep deprivation: simulated gentle handling using a yoked control. Sleep. 12, (1), 5-12 (2010). Naylor, E., et al. Simultaneous real-time measurement of EEG/EMG and L-glutamate in mice: A biosensor study of neuronal activity during sleep. J Electroanal Chem (Lausanne). 656, (1-2), 106-113 (2011). Naylor, E., et al. Molecules in Neuroscience. Proceedings of the 13th International Conference on In Vivo Methods, 12-16 (2010). Choi, J. H., et al. A flexible microelectrode for mouse EEG. Conf Proc IEEE Eng Med Biol Soc, 1600-1603 (2009). Choi, J. H., Koch, K. P., Poppendieck, W., Lee, M., Shin, H. S. High resolution electroencephalography in freely moving mice. J Neurophysiol. 104, (3), 1825-1834 (2010). 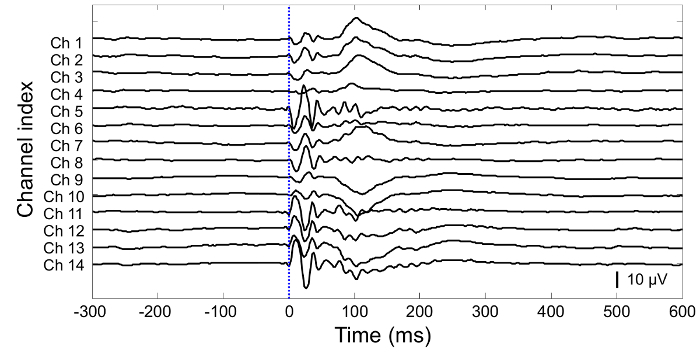 Lee, M., Shin, H. S., Choi, J. H. Simultaneous recording of brain activity and functional connectivity in the mouse brain. Conf Proc IEEE Eng Med Biol Soc, 2934-2936 (2009). Lee, M., Kim, D., Shin, H. S., Sung, H. G., Choi, J. H. High-density EEG recordings of the freely moving mice using polyimide-based microelectrode. JoVE-J Vis Exp. (47), e2562 (2011). Mégevand, P., Quairiaux, C., Lascano, A. M., Kiss, J. Z., Michel, C. M. A mouse model for studying large-scale neuronal networks using EEG mapping techniques. Neuroimage. 42, (2), 591-602 (2008). Megevand, P., et al. Long-term plasticity in mouse sensorimotor circuits after rhythmic whisker stimulation. J Neurosci. 29, (16), 5326-5335 (2009). Troncoso, E., Muller, D., Czellar, S., Zoltan Kiss, J. Epicranial sensory evoked potential recordings for repeated assessment of cortical functions in mice. J Neurosci Methods. 97, (1), 51-58 (2000). Bauschatz, J. D., Guido, V. E., Marden, C. C., Davisson, M. T., Donahue, L. R. Preliminary skull characterization and comparison of C57BL/6J, C3H/heSnJ, BALB/cByJ and DBA/2J inbred mice. http://craniofacial.jax.org/characteristics.html (2014). Keith, B., Franklin, G. P., Paxinos, G. The mouse brain in stereotaxic coordinates. Academic. California. (2008). Kawakami, M., Yamamura, K. I. Cranial bone morphometric study among mouse strains. Bmc Evol Biol. 8, (2008). Strain, G. M., Tedford, B. L. Flash and pattern reversal visual evoked potentials in C57BL/6J and B6CBAF1/J mice. Brain Res Bull. 32, (1), 57-63 (1993). Schalk, G., McFarland, D. J., Hinterberger, T., Birbaumer, N., Wolpaw, J. R. BCI2000: A general-purpose, brain-computer interface (BCI) system. Ieee Transactions on Biomedical Engineering. 51, (6), 1034-1043 (2004). Kim, D., Yeon, C., Kim, K. Development and Experimental Validation of a Dry Non-Invasive Multi-Channel Mouse Scalp EEG Sensor through Visual Evoked Potential Recordings. Sensors. 17, (2), 326 (2017). Yeon, C., Kim, D., Kim, K., Chung, E. SENSORS, 2014 IEEE. IEEE. 519-522 (2014). Kim, D., Yeon, C., Chung, E., Kim, K. SENSORS, 2015 IEEE. IEEE. 1-4 (2015). Lin, C. T., et al. Novel dry polymer foam electrodes for long-term EEG measurement. IEEE Trans Biomed Eng. 58, (5), 1200-1207 (2011). Lopez-Gordo, M. A., Sanchez-Morillo, D., Pelayo Valle, F. Dry EEG electrodes. Sensors (Basel). 14, (7), 12847-12870 (2014). Fang, Q., Bedi, R., Ahmed, B., Cosic, I. Engineering in Medicine and Biology Society, 2004. IEMBS'04. 26th Annual International Conference of the IEEE. 2995-2998 IEEE, 2995-2998 (2004). Maffei, L., Fiorentini, A., Bisti, S. Neural correlate of perceptual adaptation to gratings. Science. 182, (4116), 1036-1038 (1973). Ernst, M., Lee, M. H., Dworkin, B., Zaretsky, H. H. Pain perception decrement produced through repeated stimulation. Pain. 26, (2), 221-231 (1986).